Crack The Saree Game With Traditional Designs And Intricate Borders From This Chennai-Based Label! Confuse yourself a little more with the saree options and jewellery choices from this Chennai-based label. Cracking the saree game can be quite a task. Choosing a saree, wearing the right blouse, selecting jewellery that goes with the saree - this sounds almost similar to a process in a corporate company. We know how much thought goes beg=hind a look. So the next time you are looking to buy a saree - checkout Chennai Boutique. (well, yes, that is how simple the name is). But their products can slay you and how! We are talking sarees, kemp jewellery, and traditional lolakku from this label. 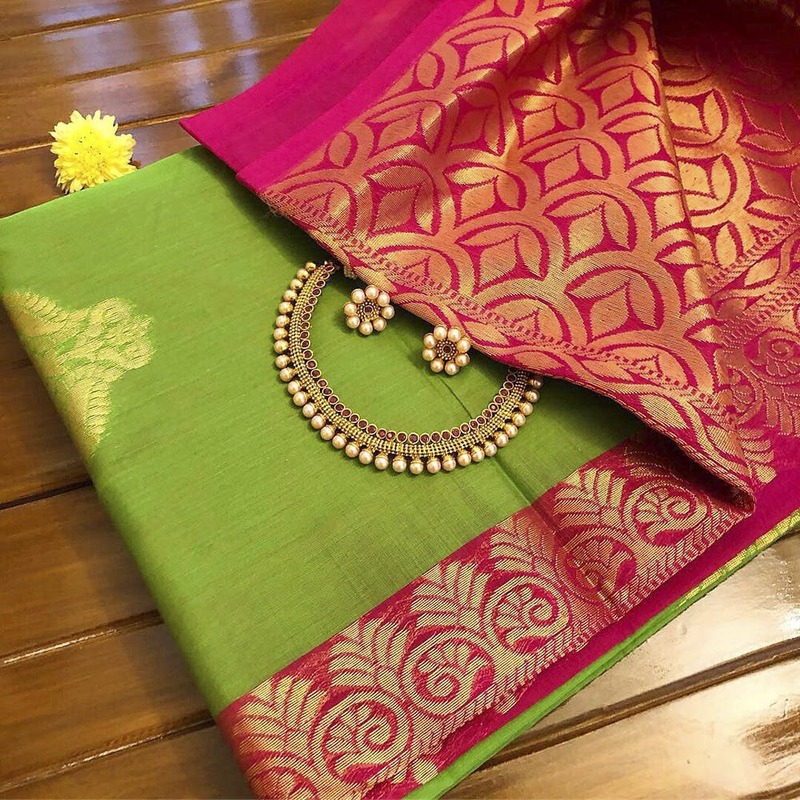 Silk cotton, Kachi cotton, Chettinadu cotton, pure cotton, this label hoard up on traditional sarees and we are drooling looking at the colours, patterns, designs, and most importantly the jewellery that you can match it all with. We absolutely love the mango yellow and green saree that comes with a beautiful pallu. Pair this with a peacock jimmiki and you can head to Mylapore for the ongoing thiruvizha. The golden plum milk saree with golden border is also a beautiful number. Match it with a haram and you know who is slaying that golu. We are totally in love with the weaver who brought together the parrot green and pink border saree! This one is classic and how. The intricate details on the border at the highlight. A pear choker and studs will go perfectly well with this one. If you are looking for something more traditional, don't forget to take a look at the Aiswariyam saree that comes with a paisley design, beautiful designs and a border that speaks volumes by itself. Their traditional jimmikis paired with checks yellow and red saree stole our heart. Other than the jimmikis and harams, they also have bridal hair vine.